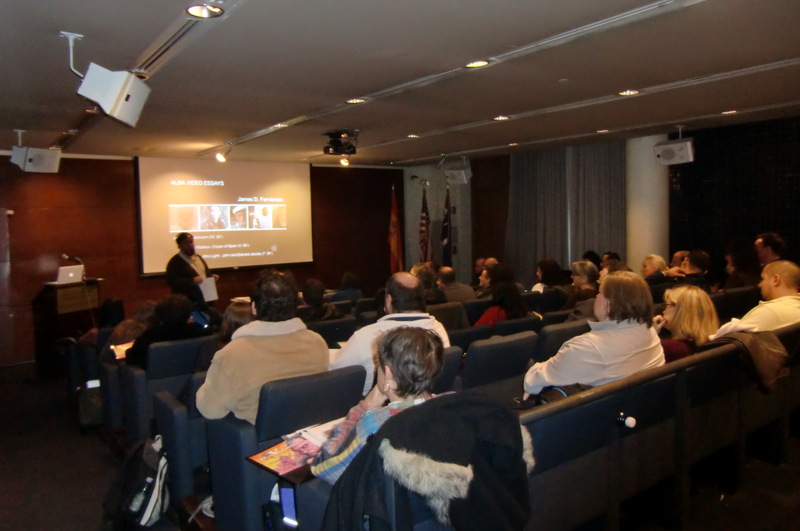 On Tuesday, November 2, over 40 New York City public high school teachers of social studies attended the second annual ALBA/Puffin Professional Development Day at NYU’s King Juan Carlos I of Spain Center. The teachers were selected from a pool of almost 100 applicants. In the morning session, James D. Fernández and Peter N. Carroll introduced the teachers to the archival resources and outreach programs available through ALBA. On hand as well were Michael Stoll, a PhD candidate at NYU’s Steinhardt School of Education, who has been helping us in our public school outreach programs, and two alumni of ALBA’s Summer Teachers Institutes, Sergei Alschen and Gabriela Calandra, who teach social studies and Spanish at the Bergen County Academies. Throughout the day, the teachers handled and discussed a set of documents that included letters by Hy Katz, James Lardner, Canute Frankson, Hy Greenfield, Harry Meloff and Crawford Morgan, and they discussed ways of incorporating these primary source materials into their curricula. In the afternoon, Michael Nash, Director of Tamiment Library, welcomed them to the archive, introducing them to some of the visual sources. We are particularly grateful to Patricia Bauman and the Puffin Foundation for generously sponsoring this wonderful educational initiative. WE WERE PRIVILEGED TO KNOW BILL SUSMAN(VET OF ALBA)AND ARE HONORING HIS WIFE, HELENE, ON HER BIG BIRTHDAY THIS WEEK, DECEMBER 26, 2010. WE SALUTE YOU AND SEND A CONTRIBUTION IN HER HONOR. Mr. schwartz: did you salute with a clenched fist. The “brigade” from what I read in this magazine was communist. At least admit it. to think we pay a fortune to send our kids to school with this element at the helm.